Have a party the right way with a Sephra Classic Home Chocolate Fountain and Chocolate Fondue package. This package includes the Sephra Classic Fondue Fountain, 8 pounds of our milk fountain ready couverture fondue chocolate (feeds about 50 people) and 6 color coded metal skewers. Use the fountain for all kinds of fondue, such as cheese fondue, BBQ Sauce and Ranch Dressing. 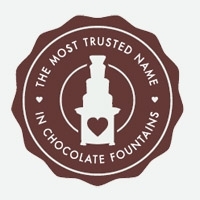 Sephra is the most trusted name in chocolate fountains and we guarantee you will be more than satisified with your fountain order. Sephra chocolate is the best chocolate for fondue fountains, easy to use and you do NOT need to add any oil to the chocolate for it to flow properly.